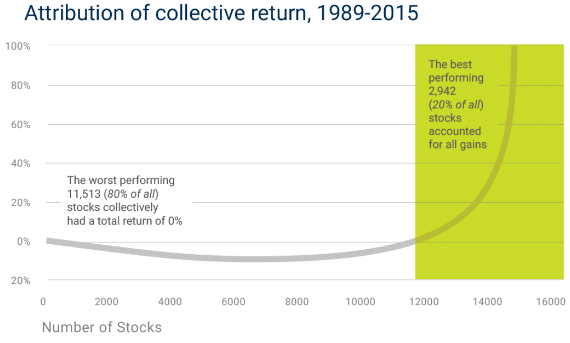 Returns are more skewed than we would like. Identification of the issue is necessary for investoes. Active management has basis risk versus the few outperformers over time. Investment consultants have often tried to analyze money manager performance for the purpose of making allocations of client capital. Faced with a dilemma of an uncertain future the consultants focus on process and people. Let’s focus on the process. ‘’The poorest service will be repaid with thanks.’’ Shakespeare. The Taming of the Shrew. Prior to the explosion of data, opinions and blogs on the internet; there was once a time where the beginning of the investment process was the aggregation of data before the modeling of said data and the result. Almost, all investment managers professed that their shop had a competitive advantage at the early stages of decision making capped off by the wisdom and judgement of the founder of the firm. If properly channeled the wisdom and judgement of the firm created long term wealth. “It should be what O’clock I say it is.”’ Shakespeare. The Taming of the Shrew. Currently the aggregation of data and modeling are a commodity and there is no purpose to have a team of young analysts copying models available on Seeking Alpha. The business does not reward or require broad analysis that is commoditized rather its measurement of performance is now so influenced by the skew of the market that financial modeling has given way to capitalization worship. This skew (the verb) is the one of short -term performance, it requires little patience and insight. But the surprise here is not that the 2018 market is a narrow market that is dominated by FAANG and that the broader market will revert to the mean and have its day - it is the fact that it has always been this way. While the short-term performance of the market has its rotating flavor of the year, the market’s long-term performance has always had a Pareto effect in terms of wealth creation. It is in fact a skewed probability distribution (the adjective). Money managers have been blaming the verb while ignoring the adjective. Ibbotson produced a chart that became gospel among asset allocators that suggests that small capitalization stocks outperform larger capitalization stocks. The premise begins by ignoring taxes and transaction costs. It also has data from a capital formation system that is a relic of the past. Small capitalization stocks currently are not the next Microsoft, they are companies that have stalled, failed or never started. The final point is that the results portrayed are not investable by institutional investors. The investment management industry has been chasing a process to deliver an outcome but may have ignored the message of the outcome. Wealth hasn’t been created by allocating to the best slice of capitalization it has been made by investing in the right slice of the distribution of returns. Meanwhile, the owner of the slice has been changing. Unicorns anyone? As we have shared with you before, the Pareto Effect appears in the long-term wealth creation of stocks. The amount of wealth that needs to be created in the market demands that it comes from a select group. The qualifications are an ability to reinvest large amounts of capital continuously over a substantial period. Often the data in the investment business is analyzed as probability distributions and assumed to be a normal distribution. Perhaps in a short enough time frame stock returns will have some winners, some losers and bob around a mean. This is placing the emphasis on short term prices. Long term wealth creation is a power curve with the winners creating all the wealth. It is much more important to invest based on wealth creation rather than capitalization. To state the obvious- Berkshire Hathaway created extraordinary wealth for its owners because it was at the far end of the power curve distribution not because it was a small capitalization stock at one time. When investors talk about a narrow market the emphasis may be on short term results however there is a narrow market describing long term wealth creation, yet many diversified investors begin by ignoring the statistics behind the desired outcome. “We will have rings and things and fine array”. Shakespeare. The Taming of the Shrew. The capitalization worship has turned the public markets into a 50 stock must own market that is losing the value of stock picking and capital allocating. This skew of the market is reducing the reward of independent analysis in the public markets while it is increasing its value in the private markets. The more wealth creators that can be kept away from the increasingly brain-dead public investors, the more profits for the early entrants. There continues to be an erosion of “courtesy capitalism.” There are now agents with significant interest in not leaving any returns on the table for the public markets, we call the companies unicorns and the agents disruptors. Which Skew do we want- Public Short Term or Wealth Building Long Term? While the public market investors lose the skills that produced the Ibbotson numbers there are private investors sharpening them. If the public market participants are continually evaluated on short term results where stocks tend to be normally distributed there will be a loss of wealth creation because riding the power curve takes time. Investors cannot afford to miss out on the growth segment of the stock market. ETFs and funds that buy growing companies may require a longer time horizon, but they are the place to grow wealth.